Soldak’s newly released sci-fi RPG space-sim mashup Drox Operative continues the indie dev’s strong suit as a studio that imprints every game with impressive attention to detail and expansive features. The game itself affords near-infinite gameplay that changes with every passing minute, actually mimicking the events of real life, as one small decision affects everything else. The environments and NPCs evolve and thrive behind the scenes in a constantly moving and shifting universe, making for a distinctly enjoyable experience that mirror other titles from Soldak such as Din’s Curse (which we also had the pleasure to review). 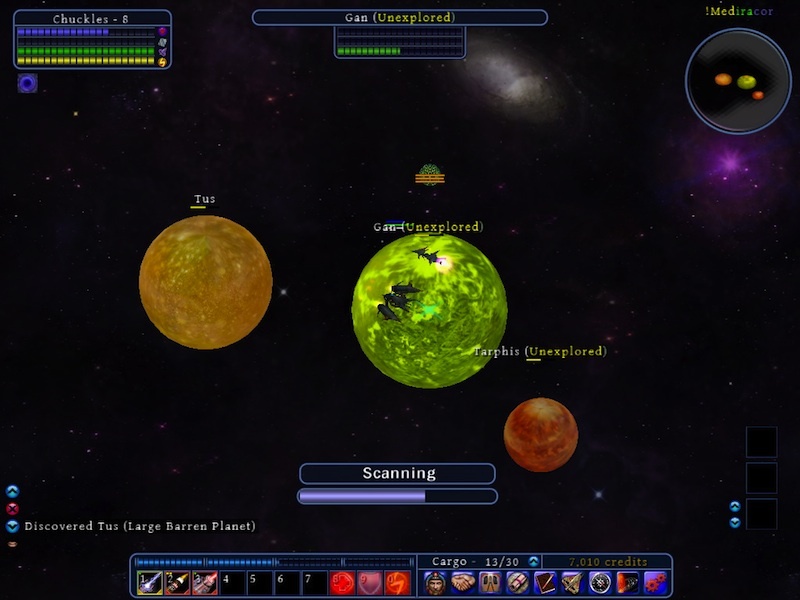 With a variety of ships, NPCs with their own distinct alien races with their own personalities, affinities and attributes, players can forge many intergalactic alliances with the game’s expansive political system while they build up their ship with a huge arsenal of weapons and items, and become a force to be reckoned with in the galaxy. Drox Operative feels like a bit like Sim City in terms of the expanding planet colonies, but also infuses a semi-Mass Effect type of dialogue system where players can make decisions with alien races, forge alliances or deep rivalries that culminate in interstellar warfare. The overview spaceship flying view is reminiscent of old-school Atari space shooters, but also incorporates that Faster Than Light (FTL) feel with constant upgrades and items to equip. All in all, Drox Operative is a very deep game, one that you could pour dozens of hours into and still not beat, and you definitely get your money’s worth. Every time you play the game it’s different, and players can control many of the various interfaces and settings to deliver a wholly original experience with every playthrough. Drox Operative‘s story arc isn’t fixed into place like many other games, and instead delivers a totally evolved and ever-changing variety of scenarios that fully represent Soldak’s attention to detail. Drox Operative pits gamers into the role of an interstellar operative of the Drox race, who are trying to bring various alien races to their cause. Players are sent on an epic diplomatic mission to ally themselves with a variety of alien (and human) races of varied origin, status and intelligence. To gain each race’s trust, players must partake in missions and make offers, as well as interact with the race’s many colonies throughout the universe. Drox Operative is an ever-changing story that brings gamers across a multitude of worlds and planets, stretching beyond the vast rims of the galaxy on an engaging and truly remarkable journey across the stars. 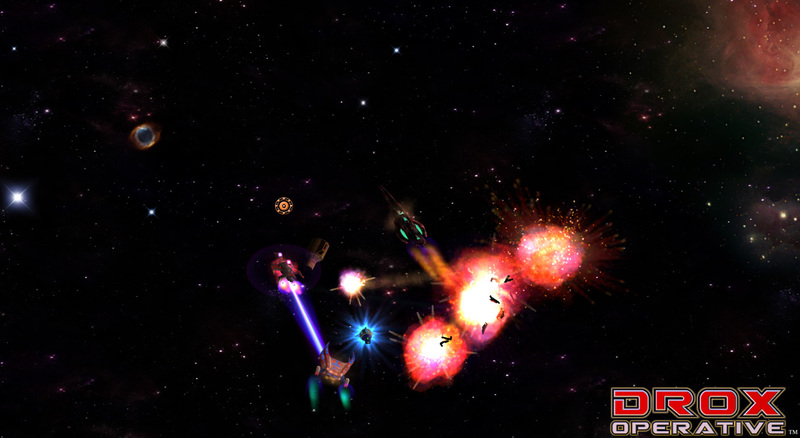 Drox Operative operates along the lines of a 2-D space shooter where movement is fixed within a two-dimensional plane. The graphics themselves are quite good and are in 3-D, but movement and interstellar combat is much as it is on an Atari 2600 console. In essence, Soldak’s inventive sci-fi shooter is a space sim along the lines of Faster Than Light, but unlike FTL, players can move freely through space as they please. At first, the control scheme is a bit complicated, but once players integrate themselves with the scheme and reconfigure the mapped buttons, they should be fine. Gamers who have played Soldak’s medieval RPG Din’s Curse will notice many resemblances between that game and Drox Operative: there are many borrowed icons as well as control schemes and basic interfaces that can be seen within the game. Players can definitely tell that Soldak’s signature elements are within the game, mainly the randomness of the galaxies. What makes Drox Operative such a great game is that it’s a dynamic and constantly shifting cosmos: the NPCs don’t wait idly by for you to interact with them, nor are they stuck in stasis and waiting for you to come along. Every race, every character, every single ship has a mind of its own and goals of its own, co-ordinating attacks against other planet colonies and announcing war on enemies. This air of an totally interactive and randomly fluctuating universe truly imbibes a sense of both awe and chaos within players, and there are many times where it can get confusing and aggravating, but for the most part it’s amazing. It certainly re-kindles the magic that gamers feel in such titles as Torchlight II or Diablo II where all the loot is completely randomized–that element of not knowing what’s out there, what’s coming next is truly and adequately embraced in Drox Operative. In the game, players take ahold of their very own ship, collecting a huge variety of items (weapons, shield generators, thrusters, etc.) to customize their appearance and abilities of their vessel. 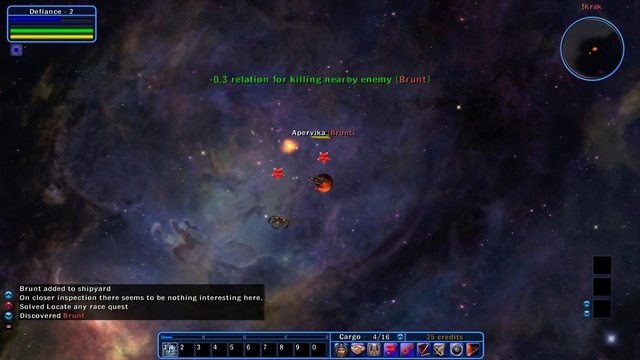 The UI is basically that of Din’s Curse, with standard abilities, like the normal laser attack or mines, being mapped on the action bar (think WoW‘s skill bar). 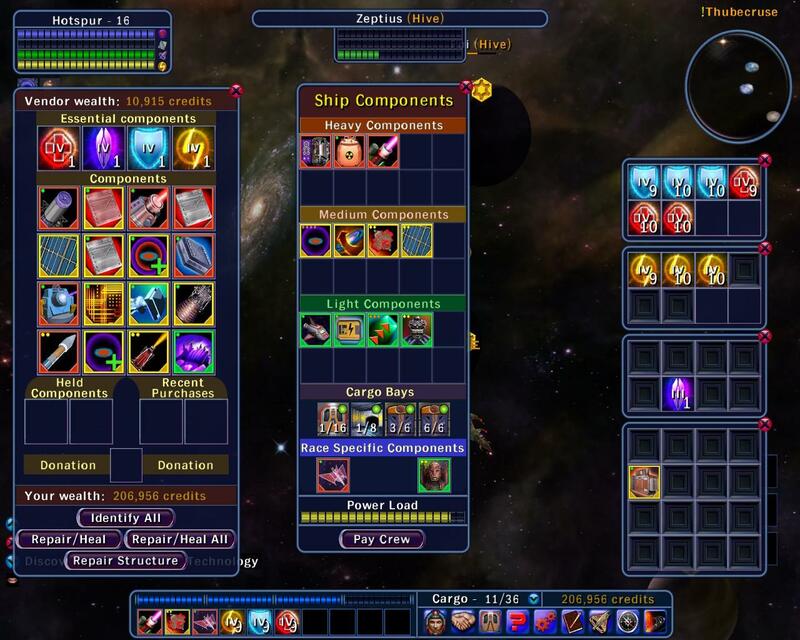 The inventory and equip screen is pretty straightfoward: as players destroy enemy vessels that are peppered throughout the galaxy they retain a variety of items from enemies, as well as from storage depots that are scattered throughout the universe. Instead of skills, players only get a variety of attributes that directly affect a ship’s integrity. The “skills,” per se, are unlocked with higher quality weaponry, which are then mapped to the action bar and can be used for more firepower and explosive results in combat. In terms of content, Drox Operative is massive: it is made up of so many different dynamic pieces that all fit together to make one huge inter-connected puzzle. Players can forge alliances (and rivalries) with any race within the game, building their relationships with hours upon hours of missions and seemingly never-ending quests. Soldak Entertainment truly has brought a gem to the world of indie games with Drox Operative. This sci-fi RPG space sim brings a high level of replayability with an incredible level of content, allowing gamers virtually infinite gameplay that’s ever-shifting and dynamically changing — an element which is much akin to our own universe. In terms of original content and sheer creativity, Drox Operative shines brightly like a star within space, pulsing with radiance that beckons gamers across the universe to take part in its epic sci-fi adventure. The game brings hundreds of hours worth of gameplay that’s nearly never-ending, with a whole galaxy of ship upgrades, weapons, items and crew members (as well as unlockables) to keep even the heartiest of sim-lovers out there happy.